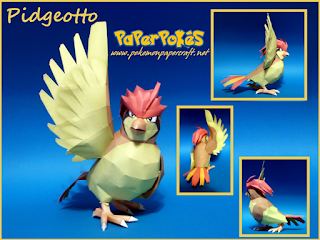 Interesting Facts: Pidgeotto is a large raptor-like bird. While its primary color is brown, its plumage is much more elaborate than its pre-evolution, Pidgey. Its head-crest is much longer than Pidgey's and is a reddish color. The plumage of its tail is also quite colorful, alternating between red and yellow. Other than its ornamental plumage, its basic coloration is similar to Pidgey, with pinkish-gray feet and black markings around its eyes. Pidgeotto has powerful talons to grasp prey so these claws can inflict a lot of damage. NOTES: Build from the head down, being careful with the hair and wing. Close at the 'ankle' where the feet and legs meet. Build the feet from the claws up. If you wish, print the optional included png on the back of the last page to give the hair an inner color. a nice example of great paper model design. i just saw this and i knew i had to papercraft 'em all! Please make Mega Charizard Y in the pose of the posters and the pose of Game. Please. 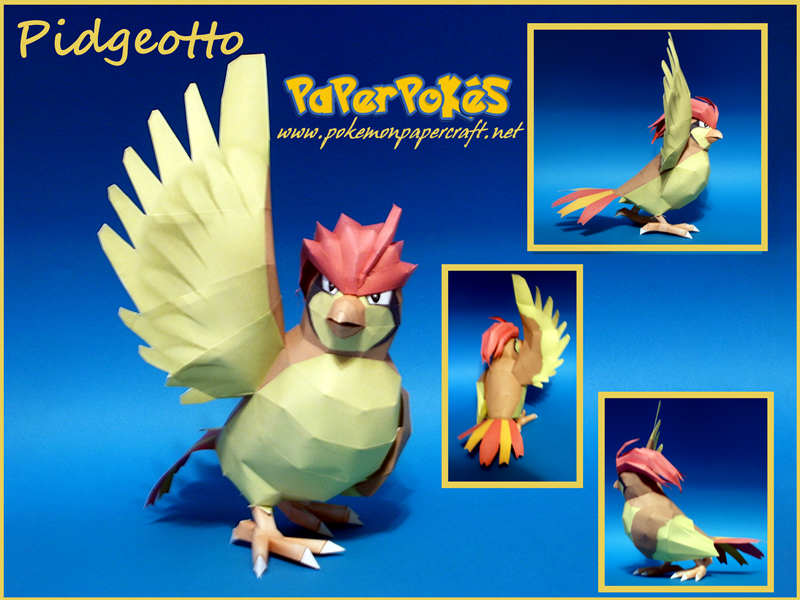 I love pidgeotto this is so cute!